Now that you have been proposed to and told everyone about your engagement (Congratulations! ), you need to determine who your bridal party will be. Normally, brides and grooms discuss how many people will stand up on each side and try to make the numbers even; however, many bridal parties have also been uneven. 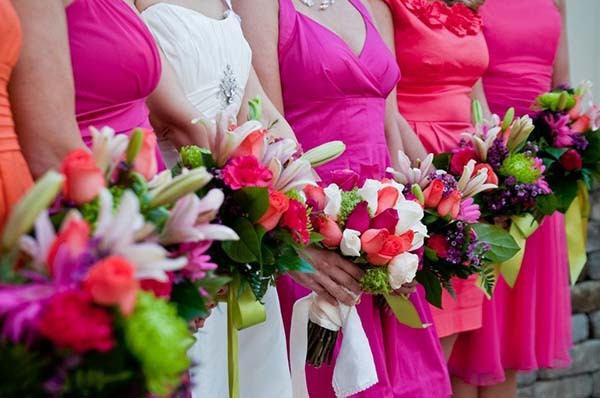 Once you have your bridesmaids chosen, you have to decide what color and style of dress you want each one to wear. Depending upon your choices or friends, you may have all heights, shapes and sizes that all dresses do not flatter as much as others. This can be a nightmare for many brides (and their bridesmaids). Yes, this day is about you and what you envision for your wedding; however, it might be a good idea to keep an open mind about what to have your wedding party wear. Finding a gown that looks good on your bridesmaids might be a better choice than fitting them into the style of dress you had envisioned. If your wedding party is uncomfortable or the dresses chosen do not flatter their shapes, moods can become a factor at the wedding along with wedding pictures that are not as good as you had hoped for. Just remember to make this an enjoyable occasion for everyone (especially you) and keep the stress level down. This could mean allowing yourself both the right to say no to a specific gown/color or allowing yourself to be less rigid on the style and allowing the girls to make their dresses work for them. Different styles of dresses in the same color can allow everyone to show their individual style as well as look good for your wedding.